Heavy monsoon rains and flooding have reportedly affected over 2 million people in Pakistan’s southern Sindh and eastern Punjab provinces. Local meteorological department predicts more rains in the days ahead, posing a threat to more people in the country. The National Disaster Management Authority says over 200,000 people have been affected in flood-hit areas in interior Sindh. Media quoted the authority as saying 100 villages were flooded in Badin district of Sindh after a breach in a major salinity drain. As a result of the flooding, people have in some cases been left marooned and have to be evacuated by Navy boats. Pakistan’s biggest eastern Punjab province was also affected by monsoon rains and flooding, according to officials. Flooding of the Sutlej river has inundated several villages in Kasur District, Punjab Province. Syed Arshad Hussain, the district coordination officer for Kasur, a city on the eastern side of Punjab bordering India, said that relief centers have been set up in eight locations and the authorities are making all other arrangements to help the affected people. He also said an assessment of needs was under way. There is also a flood threat in other areas of Punjab, where several drainage channels have overflowed. Punjab Natural Disaster Management Authority head Khalid Sher said that emergency has been declared in parts of Sialkot District while agricultural land had been flooded in the Daska administrative unit of the district. The Pakistan Meteorological Department has forecast monsoon rains 10 percent higher than normal in northern parts of the country including Upper Punjab. Aid agencies said that they are on standby after sustained rains reportedly affected up to 750,000 people in Punjab and Sindh provinces, killing up to 25 and displacing some 50,000 others, according to an informal assessment by the UN Office for the Coordination of Humanitarian Affairs in some areas of the country. According to an official brief on the flood issue in the country released on August 16, more than one million people have been affected by recent flooding in Sindh. Over 123 flood relief camps have so far been set up to deal with the displaced. While on a visit to Badin District, a most flood-hit area in Sindh, Pakistani Prime Minister Gilani said that tents, agricultural loans and assistance in other forms would be offered to flood-hit people in Sindh. However for the moment, things on the ground seem grim and affected people said they are in miserable condition. District officials said the bigger relief agencies will be called in soon. But right now, things seem quite dismal, especially as memories of last year are still fresh in people’s minds. The World Health Organization (WHO) has shown concern over the possible breakout of diseases in the flood-hit areas in Sindh province. UN agencies said that the monsoon spells that started on August 9 have caused inundation and affected a large number of people in Punjab and Sindh provinces. 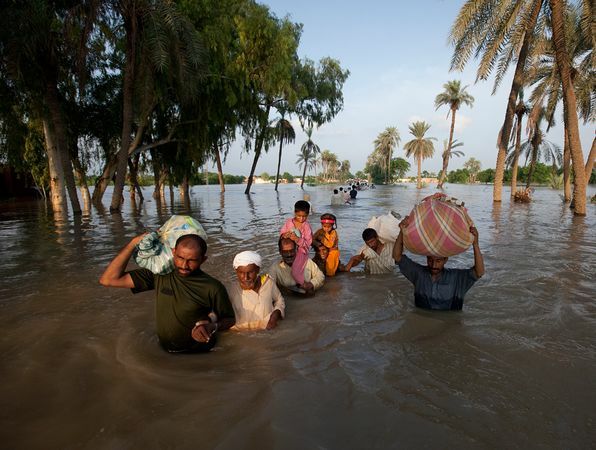 According to local authorities in Sindh, the flash floods have caused at least 23 deaths, extensive losses of livestock, destruction of many mud houses and field crops including cotton and rice and red chilies in the two provinces. Ezekiel 7:26 Disaster after disaster will come, and there will be rumor after rumor. Then they will seek a vision from a prophet, but instruction will perish from the priests and counsel from the elders. Daniel 9:13 Just as it is written in the law of Moses, all this disaster has come on us, yet we have not appeased the LORD our God by turning from our injustice and paying attention to Your truth. Amos 9:10 All the sinners among My people, who say: Disaster will never overtake or confront us, will die by the sword. Open your eyes, people of the world! The signs are all around you!